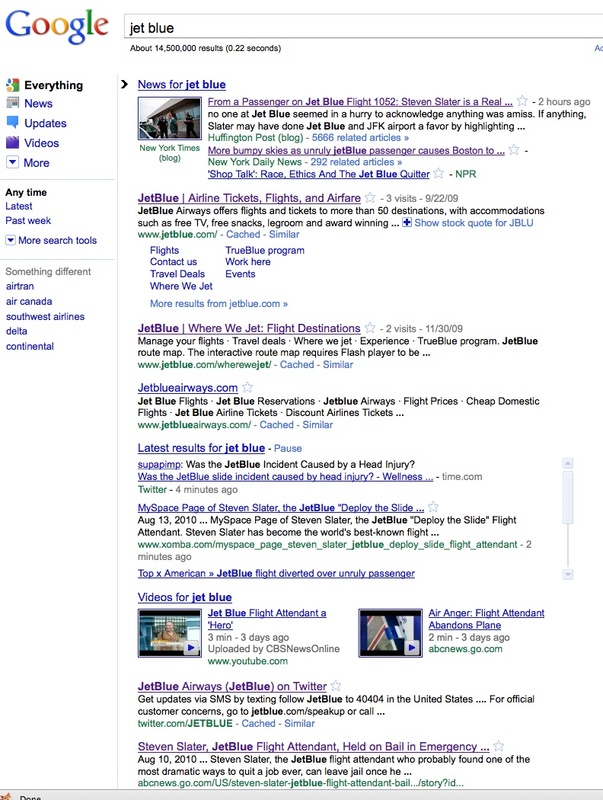 Online Reputation Management: What JetBlue can teach law firms. There are several things law firms can learn from the recent publicity of the JetBlue incident, particularly in the context of the social Web and reputation management, but three stand out. Your stakeholders want you to succeed. They want to believe that you, their law firm, do the right thing; that you’re a valuable asset to their team and that others believe as they do. Align your law firm with stakeholders, via engagement on the social Web, BEFORE a crisis strikes to give you access to, and credibility with, your stakeholders if and when an incident needs to be addressed. Transparency on the social web is critical for law firms, especially in times of high media interest, and so it must be handled with care, for both the law firm and all involved parties. The recent Steven Slater/Jet Blue “Beer Slide” saga has had everyone in a tizzy lately; especially the media, JetBlue fans, executives at JetBlue who are normally quite chatty on the social Web, and their lawyers. It appears that their legal counsel prompted Jet Blue’s silence in the early aftermath of the incident. Three cheers for the step-away-from-the-microphone advice during the initial brouhaha. In this case it turned out to be great advice. Despite the negative squawking that penetrated the net – Where are they? Why aren’t they telling us what’s going on? 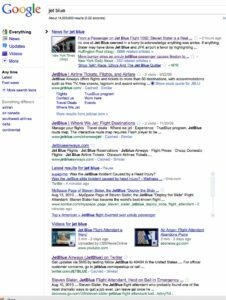 – JetBlue pulled away from business as usual on the social Web until they gathered the essence and then posted a brief, but highly effective, entry on their corporate blog, BlueTales. They presented a side of the story with a compassionate, yet lighthearted, persona addressing the issues they were facing. They asked their online stakeholders to hold on. Lesson One: We love you! …this is your chance to rise above all the nasty comments left online, by being gracious and forgiving. Offer his job back; don’t worry, he won’t take it; give him a stern lecture; and remind all passengers they MUST obey, by federal law, the orders of flight attendents, who are NOT just glorified waitresses and waiters. Here’s your chance: don’t blow it! Thank you for acknowledging your fine employees at this time. My family and I have always been very true, loyal customers of JetBlue. I think JetBlue should show the world, yes the world, that there is a lot of abuse in the service industry. Please show the world that there is a company that has empathy for their loyal employees. I feel your company is in the best position to teach the world it needs to be polite to people in the service industry and people in general. The world needs this lesson. Show us your empathy. This is a goldmine opportunity. You should definitely hire this guy, and have him make a bunch of funny YouTube videos about the dos and don’ts of carryon luggage. Have him try to shove a size 10 carry-on into a size 9 over-head, sideways. At the end he could have a little sign off (think Dan Rather’s “Courage!”) and then take the chute out of the plane, like Batman. If you don’t somebody else will, why not get the credit for being fair to someone who is viewed by many as a hero, and at the same time turn some lemon-like bad publicity into some earned advertising lemonade. I’ve flown with Jet Blue and I have nothing but good stuff to say! I don’t think this story will tarnish ur reputation. Your a great little airline keep doing what your doing it works 🙂 I really like that Google maps thing that says where the plane is that is so cool! Okay, okay, so we don’t expect law firm clients to be in love with their law firms in the same way they might love their preferred airline. BUT, take for example today’s headline story on the National Law Journal site. Hunton & Williams has been hit with a $150 million lawsuit in Wisconsin claiming that the law firm maliciously squeezed a broker out of a contract and should pay up for the company’s losses. What if, in a circumstance like this, there was a social channel (blog, website, discussion board, Facebook page, whatever) where the law firm laid out, after careful examination and with some transparency, the situation to the extent allowed by ethics and privilege? What if loyal clients added their comments? How would that impact the reputation of the law firm? How would that impact the clients’ perception that their voices mattered? How would it give readers what they wanted to hear and give them understanding? Before you say, “noooo way would we open up the pipes and let people trash us,” I say, why is that? Why do you think you’d get trashed? Don’t you know you have clients who really do depend on you? Sure there might be people who would use the opportunity to grind an ax, but I’m going to take a guess that, over all, sophisticated readers would see right through that. Especially if you were being transparent, i.e. human, rational, reasonable business professionals who practice law and deliver value to clients. Lesson Two: Align with stakeholders before the crisis hits. Law firms that are still on the ledge or are not taking the social Web seriously may be in for a surprise the next time they need to communicate with a broad base of share stakeholders. (See also Toyota Recall) Best to be proactive and get a social media presence now. Lesson three: Be transparent, but handle with care. I am not suggesting that law firms or anyone should try cases in the media. We all know that strategy. Sometimes it works and other times it hurts. However, it doesn’t hurt to be prepared and the social Web needs your attention. When something dramatic happens, the media is looking for a story. They’ll get it where ever and however they can. In the pre-Internet days they would pull quotes and sentiment from passersby. That hasn’t changed, only now they have access to those sources 24/7 without leaving their desks, thanks to user generated content. To make matters more intense, passersby are telling their stories without the filter of the media. Prepared statements from public relations departments and executives are becoming passé where the social Web is involved. Canned statements are ineffective unless they are handled with transparency and human perspective. The social Web demands it. Woe to the law firm who ignores it. Eventually it WILL catch up to you. On the flip side, speaking too early or too loudly may come back to haunt you. It’s a new PR approach, best to be prepared to handle it carefully. Maybe if we–law firms–were more transparent, within ethical boundaries, people could be educated in the subtleties of the profession and attitudes would shift. After all, aren’t most civil disputes and legal actions the result of misunderstandings? The law is immense and difficult to interpret. What is your law firm doing to engage with their constituencies on the social Web so that you will have ready access to manage your reputation proactively? totally worth reading for. . . a relevant source of information. .